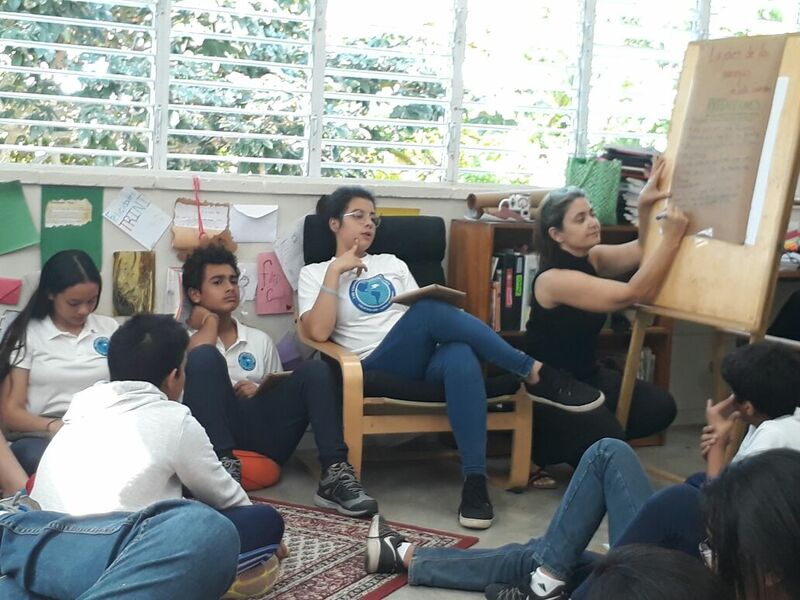 Recently, a small bookstore in Santo Domingo held an event in which readers could come in to choose a book, have something to drink, and read for a while. Pretty standard fare — except that all the books were wrapped in brown paper, organized by genre, and only gave small hints about what the book was about. 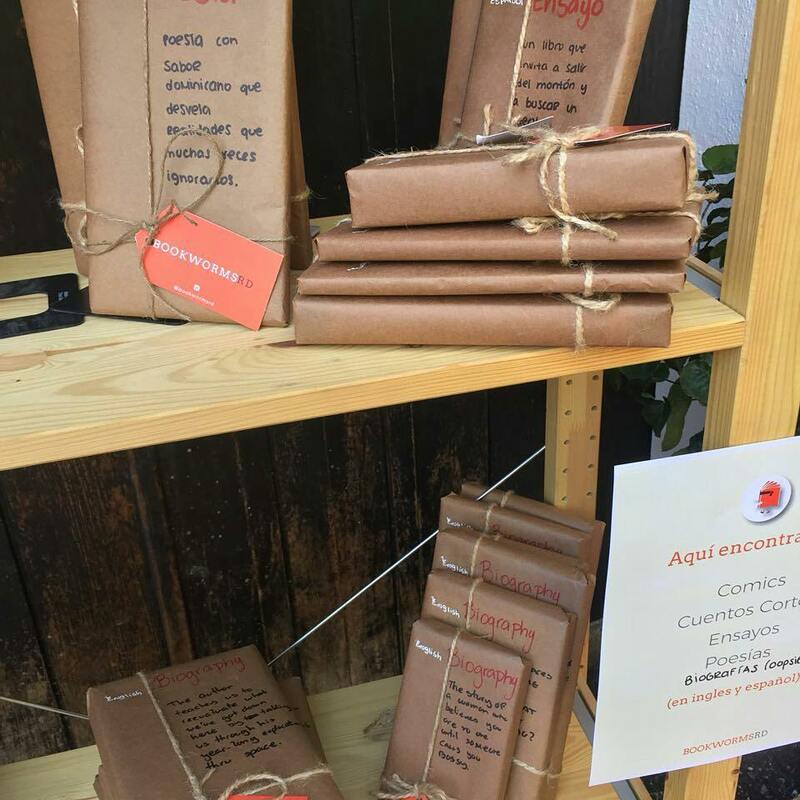 The event was a huge hit: people loved discovering what was underneath that mysterious brown paper. 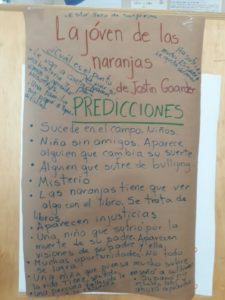 After hearing about the event, Pia, our 7th grade Spanish literature teacher, decided this would be a great way to stir up a buzz about the next shared reading book she’d be reading with her students. 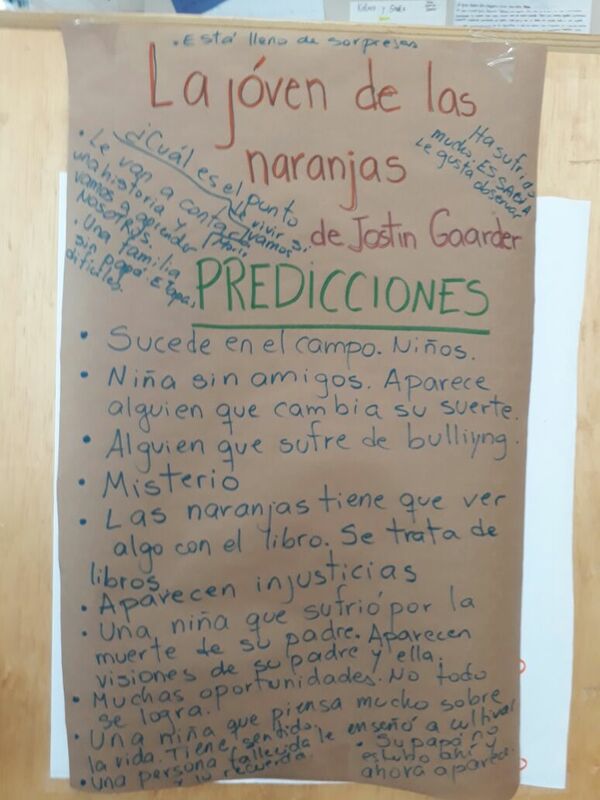 Her class was about to read La joven de las naranjas by Jostein Gaarder, so she wrapped the books in brown paper and added a different quote from the book to each wrapping. She also included an orange candy at each table that hinted at what the book was about. As students entered the classroom, their curiosity was immediately piqued: “Hey, what’s this?” “Can we open it?” “Pia, is this for us?” the students asked. There was an inquisitive hum in the air and Pia had the kids’ full attention. 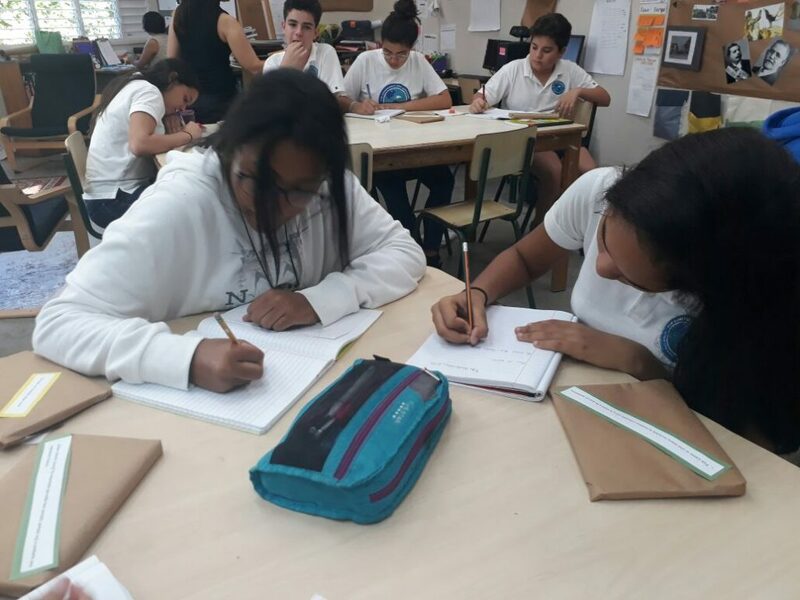 She asked the students to have a look at the quotes on their books and to write a short prediction about what they thought the book would be about. Pia told me that although La joven de las naranjas is an excellent book, the beginning is a little slow and can sometimes lose her young readers. 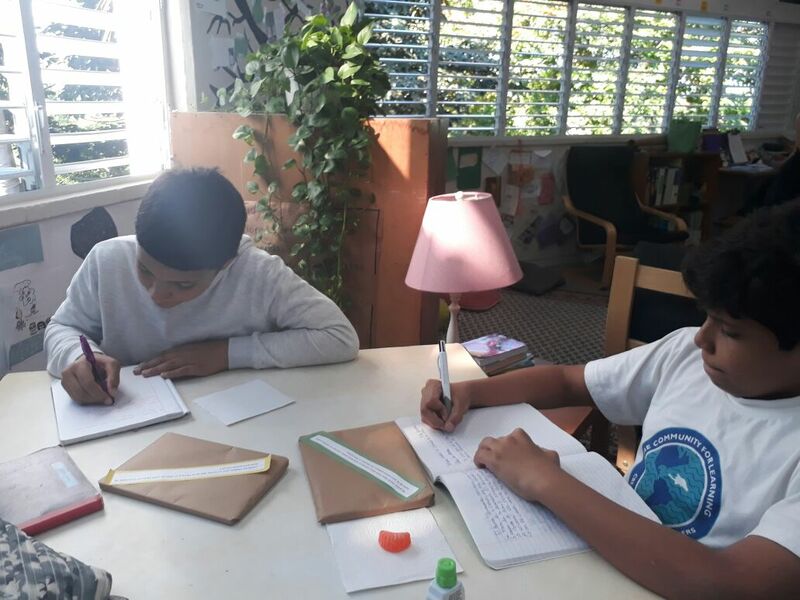 But not this time: eager to open those packages and discover what the book was about, the students had no trouble sustaining their attention until the book took on a life of its own. I can envision so many different ways to hook students with the simple use of brown paper and some clues. Who’s not intrigued by a mystery? I’d love to hear how you use this idea to create a buzz in your classroom. I’m going to be giving this a try as we head back to school this week. If you try it, I’d love to hear about it – please share! Gracias por compartir esta experiencia. Fue un momento mágico!!! Y realmente están muy entusiasmados con este libro tan filosófico y tan fabuloso! Gracias por la idea, tan sencilla pero poderosa Pia! I’m totally going to try this. Thanks for sharing! Love the sense of mystery in this. Great way to enage imagination! It is! And you are so right Gillian, awakening the imagination makes the learning so much deeper. I love this idea!!! 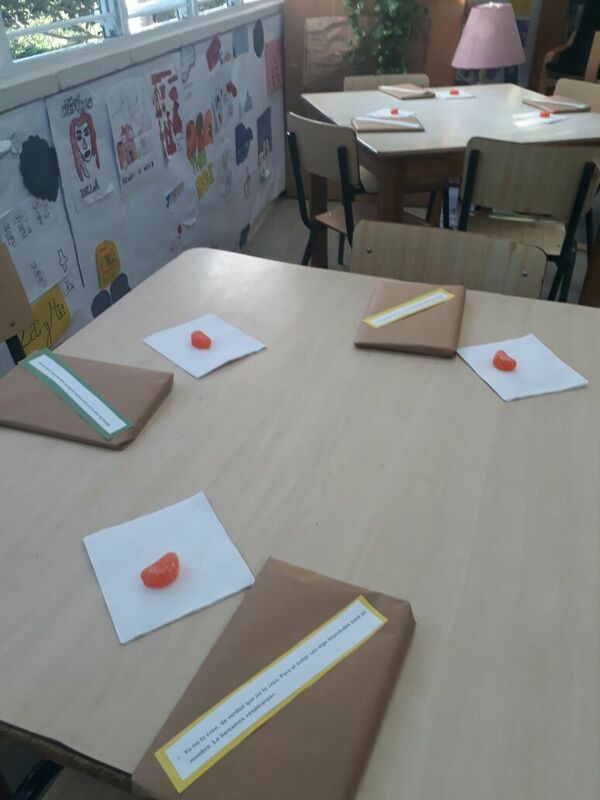 The simplicity of the wrapping, the orange treat, and the book quotes were just enough to add to the intrigue. Their prereading predictions were probably deeper than usual. Thanks for the share!!! I always love your posts, Carla. Yes, the prereading predictions were amazing and as the students heard other quotes they kept revising their predictions. It was a powerful discussion. Thank you for taking the time to read and comment, Marilyn! What an awesome idea! It’s amazing how sometimes it’s the simple things that can really catch our students’ attention and set the whole experience up to be more successful. Thank you for sharing! I agree, Aubrey: just a little bit of brown paper… But as Gillian says, it’s all about capturing their imagination. I tried it in 11th grade last week and the students were excited and engaged – a great first day back!